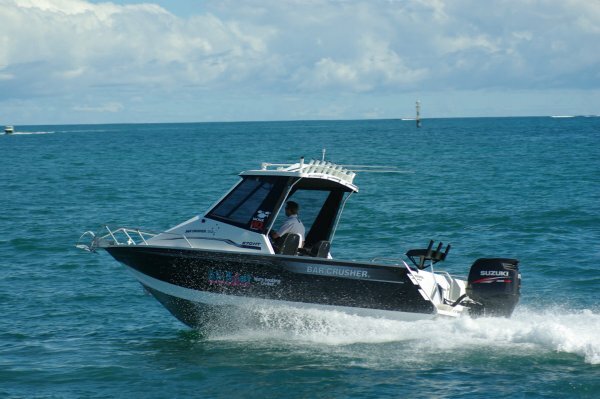 The Bar Crusher 670HT does not have drink holders, carpet or a glove box, and not because the builder is paring the dollars: items that do not help, or even impede, a good day’s fishing do not get a guernsey here. 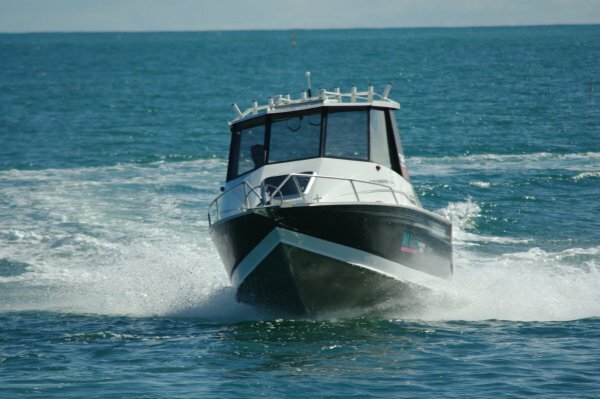 Not that you need a hairy chest to drive one: this boat offers civilized travel and a lot of clever thinking. But first and foremost it is about giving fish a bad day. 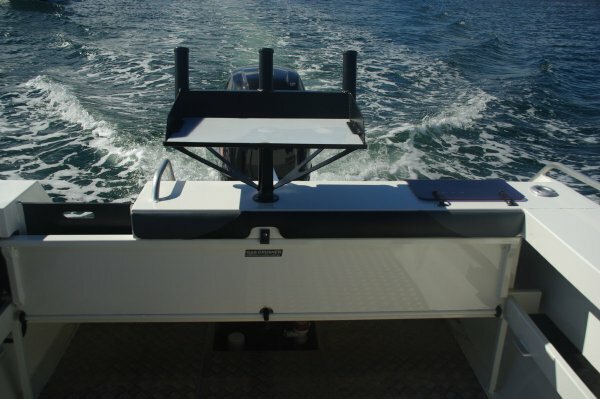 The carpetless chequer plate aluminium deck, for instance, is there for minimum cleaning after boating them. The cuddy could have you wondering though; it is just about long enough to sleep in and has huge volume because it extends out to the sides. Put it down to shelter for exhausted anglers. The HT in the name means hardtop, and this is one of the permanent sort with glass all the way up. None of this glass opens so you might need to crack open the fore hatch on torrid days. It is, incidentally, a ripper hatch: large, clear, and with an internal step up to it that means you can stay off the bunk cushion. Wherever you can sit or stand on the 670 there is something to hang on to. Rails are up and across the hardtop structure, across and at the sides of the dash, and at the quarters. An indication that this is a boat intended to be driven hard. 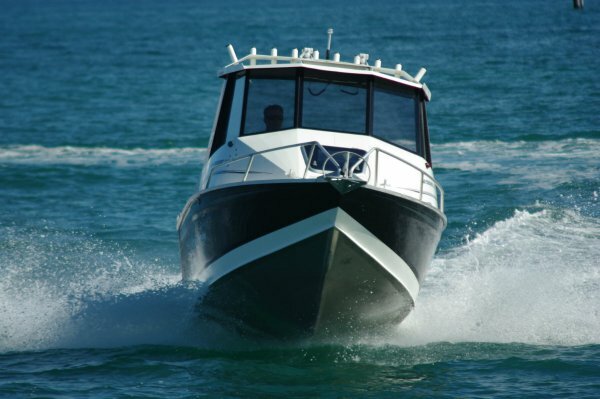 It has the tough structure for the job and the hull shape: a steep deadrise and a sharp forefoot. The balance for this is the automatic water ballasting system, a system pioneered in Australia by Bar Crusher. It really does the trick: close the throttle and the ballast chamber fills immediately; movement around the deck then has little effect on the hull. The wide side decks that effectively limit how far from the centerline people weight can be taken probably helps here, as does the low non self-draining deck. 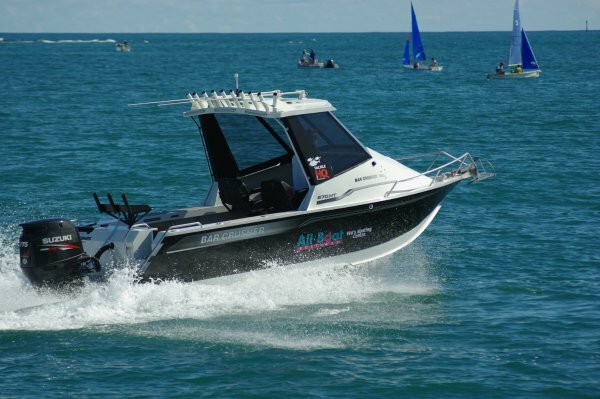 A plus with that is that standing against those coamings feels a lot more secure than on most aluminium boats: their height is 800mm – way up the thighs. Seating is a pair of excellent swivels on locker bases, and a basic drop-down bench aft. This doubles as the cover for the twin batteries, and reveals the high standard of wiring. The main seats are thoughtfully provided with footrests both fore and aft, but I found they can bite. Standing ahead of the passenger seat put my bare shins in contact with the sharpish rest until I took more care exactly where I put my feet. The driving position is very good sitting or standing. It faces a matt black dash – a smart idea to eliminate reflections – that has space for a pair of plotters and a host of minor controls. The reverse side of the dash has the quickest and most thorough access to the electronics’ underwear that I have encountered. 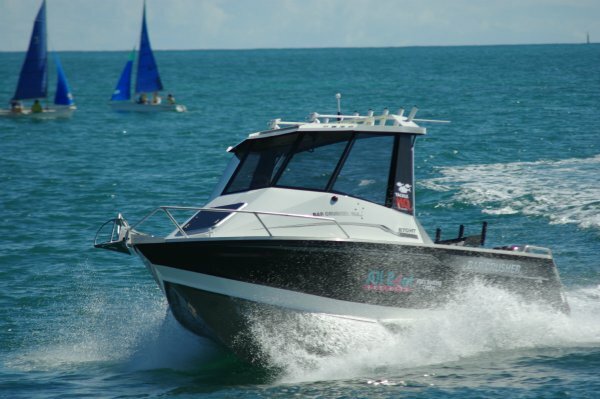 Maximum power for the 670 is 175hp, and that is what we had in the form of a Suzuki four-stroke. Maximum speed was around 35 knots, and the 25 knot cruising speed we mainly used was relaxing stuff. The sea was only slight so we chased wakes to give the hull something to think about; we found some big ones and attacked them with all 35 knots. The results were a bit noisy but otherwise almost without sensation. The hull works as advertised. A lot of thought went into this boat’s detail. Everywhere there is a chance of a rattle is carpet lined. Arrangements for getting from cockpit to side deck are as good as they come, and non skid patches abound. All fishing items such as rod holders, bait board, bait tank and deck wash seem perfectly integrated. And how many boats come with a burley bucket and muncher? The Bar Crusher trailer helped end the day well. 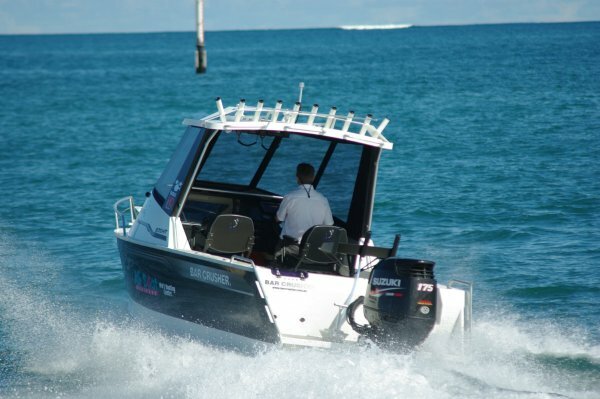 It is fitted with an auto catch and release that make one-man drive on operations easy. An arrangement of bungee cord and gravity, its simplicity is foolproof until they invent a better fool.